Chicago | Reuters — U.S. soybean futures slid to fresh lows on Friday and the most-active contract closed at the lowest in nearly a decade after a government report reinforced concerns that the trade dispute with China will dent exports and lead to a build-up in stocks. Corn futures followed soybeans lower, with additional pressure from a favourable weather forecast for much of the U.S. Midwest crop. Wheat, however, jumped for a second straight day as crop production shortfalls in the EU and Black Sea region stoked concerns about tightening global stocks. Trade tensions between the U.S. and China remained a drag on soybeans a day after the U.S. Department of Agriculture (USDA) slashed its U.S. export forecast for the 2018-19 season by 250 million bushels and projected end-of-season stocks at the highest on record. China raised tariffs on U.S. soybeans a week ago in retaliation for U.S. tariffs on Chinese goods. Moves by Beijing to shift to other soybean suppliers and alternative feeds, along with expanded soy production in Brazil, could limit long term U.S. soy demand by the world’s largest importer of the oilseed, traders said. “There are legitimate concerns that we could lose China as a soybean buyer,” said Karl Setzer, analyst with MaxYield Cooperative. 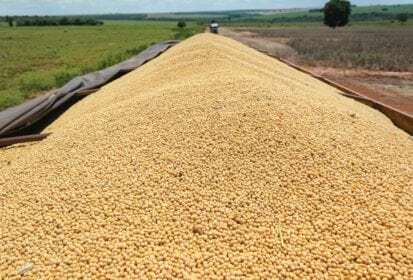 China’s soybean imports in June jumped 13.1 per cent from a year ago as buyers scooped up Brazilian supplies to avoid potentially higher costs on U.S. shipments. Brazil is expected to expand soybean plantings to a record high next season, agricultural consultancy Safras + Mercado said Friday. Chicago Board of Trade (CBOT) August soybeans ended 15 cents lower at $8.18-3/4 a bushel, down 6.7 per cent in the week and the sixth weekly drop in seven weeks (all figures US$). New-crop November fell 15 cents to $8.34-1/4, settling at the lowest level for a most-active contract since Dec. 10, 2008. August through January 2020 all posted contract lows on Friday. Corn was pressured by forecasts for rain and milder temperatures in the Midwest following above-normal heat over the weekend. Much of the crop is entering pollination, a development stage when stressful weather can hurt yields. CBOT September corn was 4-1/2 cents lower at $3.41-1/4 a bushel, down 5.3 per cent for the week. New-crop December was down 4-1/2 cents at $3.54-3/4. Wheat prices climbed after USDA raised its U.S. export forecast and lowered Russia and EU harvest projections. CBOT September wheat rose 12-1/2 cents to $4.97 a bushel, bud ended down 3.5 per cent from a week ago. — Karl Plume reports on agriculture and commodities for Reuters from Chicago; additional reporting by Nigel Hunt in London and Naveen Thukral in Singapore.